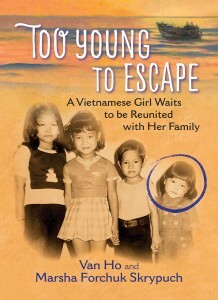 “Too Young to Escape is a compelling story about the aftermath of war for children….The fact that this book is memoir, not fiction, leaves tantalizing gaps in the story, only partly filled by interviews with Van Ho’s mother and father in the back matter. (The pictures of Van and her family will add immediacy to the reading experience.) Sensitive readers will be moved, and possibly shocked, by the challenges Van faces – but also reassured by her resilience and compassion. “Too Young To Escape is based on the true story of a Vietnamese family who came to Canada during the 1980’s. This children’s novel grew out of an earlier book authored by Skrypuch, Adrift At Sea which told about Van’s brother Tuan and his escape from Vietnam. As Skrypuch mentions in her Author’s Note at the back, she would often get questions at school presentation of Adrift At Sea about what happened to Van. Did she ever make it to Canada? So Skrypuch approached Van Ho and asked her to consider telling her story. Together they worked on telling Van’s story, as she attempted to recall as much as possible of this period of her life…. Readers will be impressed by Van Ho’s respectful kindness towards her Ba Ngoai and her obedience to her aunt and uncle who, at great risk, have taken in many family members. Van’s fortitude in dealing with being left behind, and making the best of her situation are evident in her story. But the authors also show that it was difficult for Van to come to terms with being left behind. This was especially evident when photographs began arrived from Canada of her family, happy and well settled…. “This joint project between two Canadian authors gives readers a glimpse into the thoughts, feelings, and reactions of a child being left behind when her family becomes refugees. Interviews with her father and mother at the end of the book, as well as historical photographs, allows readers to better understand why a young child might be left behind and explains the sacrifice of every family member involved in immigration as refugees. “This was a terrific story, written with a middle-grade reader in mind. It is a story of bravery as a family escapes Vietnam for a better life, ending up in Canada. This families’ plight should be taught in school and enable those born in Canada to understand the life and death choices that families have made to get to freedom…. “This story brings to life the situations and circumstances that the Vietnam refugees fled, and creates some understanding for young readers of the difficulties faced by them. The day to day reality of life in Vietnam for Van and her grandmother are shown in detail, and the photos included here allow the reader to connect with the young girl.